Percy Edgar Everett - Brighton technical school, Victoria, Australia. In 1913 Percy Everett visited Britain and Europe. When he returned to Geelong his firm was taken over by Laird & Buchan. While retaining ties with Laird & Buchan, Percy moved to Melbourne in 1914, where the wartime shortage of architectural work led him in 1916 to take up the headmastership of Brunswick Technical School. Although he maintained a private practice in these years and was responsible for the development of the Victorian Education Department’s architectural curriculum, his practical work was sparse. appreciation at the patriotic action of Mr. Everett, and also the warm thanks of the council for the valuable services rendered by him as the master of the school. The National Archives of Australia records the details of the World War I Service Record of Percy Edgar Everett. (Access status – Not yet examined). Series number : B884. Control symbol : V357972. Barcode : 6622151. 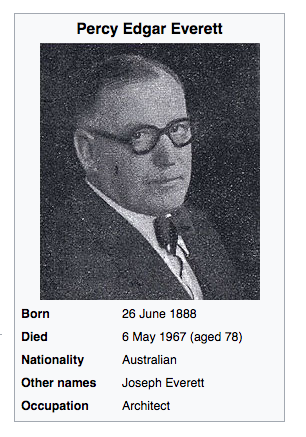 On 11 June, 1924, at Mentone Percy married according to Presbyterian rites a widow, Georgina Buchanan Arthur, née Boyd. In 1932 he was transferred to Brighton Technical School, Berwick Street, Brighton. 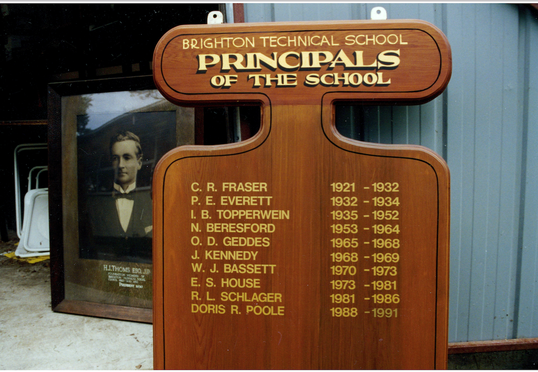 Percy Edgar Everett was the Principal of Brighton Technical School until 1934. COURTESY OF MYER BLOOM. Brighton Technical School. Berwick Street, Brighton, Victoria. Honour Board, Principals of the School. 1921 - 1991. Photograph taken 7 May, 1995, during demolition of the School. Mr. P. E. Everett Appointed. ​“It was announced after yesterday’s meeting of Cabinet that Mr. P. E. Everett had been appointed as Government architect. The position has been vacant since Mr. E. Smith retired from it about five years ago. The architectural work in connection with the New Titles Office and the remodeling of Government buildings has been carried out by outside architects. Mr. Everett, who is 46 years of age, received his early training at the Gordon Institute of Technology, Geelong. He has practiced as an architect, and his work is referred to favorably in professional circles. Mr. Everett was principal of the Brunswick technical school, and now holds a similar position in the Brighton technical school. Autocratic in temperament and energetic in application, Percy Everett made his distinctive imprint on public buildings throughout Victoria. He had completed a world tour in 1930, and in 1945, travelled to North America to study recent trends in public architecture. Although his eclecticism embraced Art Deco, American Beaux-Arts and Modernism, his additions to existing buildings were unsympathetic to the work of earlier architects. In their siting and insistently three-dimensional character, his buildings were statements of civic importance. The Commonwealth Electoral Roll for 1939 records that Percy Edgar Everett, architect, and Georgina Buchanan Everett, home duties, resided at 3 Were Street, Brighton, Victoria. The Commonwealth Electoral Roll for 1946 records that Percy Edgar Everett, architect, and Georgina Buchanan Everett, home duties, resided at 17 Were Street, Brighton, Victoria. Percy Edgar Everett is best known for the striking Modernist / Art Deco schools, hospitals, court houses, office buildings and technical colleges the Victorian Public Works Department produced over a period of 20 years, commencing in 1934. His most well known design is the Police Headquarters at Russell Street (1940-1943), giving Melbourne “its first Gotham City silhouette”. Percy Edgar Everett’s signature style reflected and often combined a range of sources including American Art Deco, Streamline Moderne, and European early Modernism, such as Brick Expressionism, the German Bauhaus and even Russian Constructivism, drawn from magazines and his two trips abroad. He was also adept at designing in historicist, domestic and rustic styles when appropriate. Perch Edgar Everett retired as Chief Architect from the Victorian Public Works Department in 1953, but continued in private practice until the late 1950s. Following the death of his wife, Georgina Buchanan Everett in 1956, he married a widow, Mavis Delgany Stewart, neé Richards, on 26 June, 1956, at Brighton. Percy Everett died at Brighton Beach, Victoria, on the 6th. May, 1967. Yarra Bend Golf House, Yarra Bend Park, Fairfield, Victoria (1936). Drouin Primary School, Drouin (1936). Melbourne Polytechnic Building B, Preston Technical College (1937). Geelong Court House, Geelong (1938). Wangaratta Court and State Offices, Wangaratta (1938). (5 & 9 1938, 7 in 1948, 6 in 1955). Essendon Technical School, Essendon, Victoria (1939). Melbourne Zoo Entrance and Fence, Royal Park (1939). Frank Tate Building, Melbourne University, Parkville (1940). State Government Offices, Ballarat, Victoria (1941). State Accident Insurance Office, 412 Collins Street, Melbourne (1941). William Angliss Food Trades, LaTrobe Street, Melbourne (1941). Russell Street Police Headquarters, Melbourne (1940-1943). Greenvale TB Sanatorium, Greenvale (1946). Australian Dictionary of Biography, by Frances O’Neill. Register of Convictions, Orders, and other Proceedings in the Court of Petty Sessions at Geelong, the 1st. day of November, 1909. “Geelong Advertiser”, 30 August, 1911, page 3. “The Age”, 14 March, 1917, page 11. National Archives of Australia World War I Service Records. “The Age”, 3 July, 1934, page 9. Commonwealth Electoral Rolls for 1939 and 1946. “Construction” Sydney, NSW, Wednesday, 2 April, 1941, page 15. Wikipedia - Online. Percy Edgar Everett.